Richard was nearly 30 when he happened on an exhibition by the Woodworkers Association of NSW and decided on woodwork as his career. Some years later in 1983 he set up his first workshop and has been designing and making solid wood furniture to commission, almost exclusively in what he calls ‘the glorious palette of Australian timbers’ ever since. In 2003 he relocated to Brisbane where he set up his dream ‘shed’. 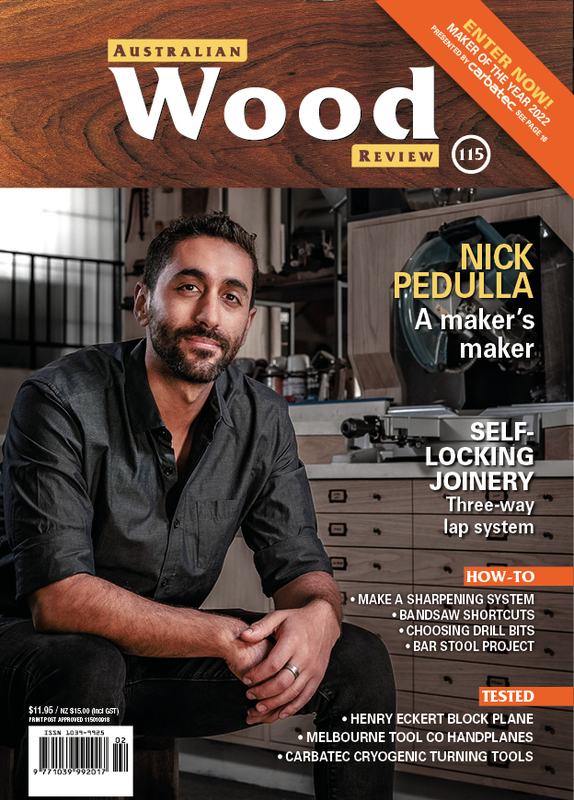 Teaching, writing about woodworking and appearing as a judge on ABC TV’s The New Inventors are other aspects of his woodworking life. Richard Vaughan’s first story was a two-part article on using the router which appeared in AWR#12 and 13. Q: How did you get into woodworking? A: After uni (English Lit and Psych majors) I travelled, just doing what felt good at the time. By the time I was 30 I’d arrived at woodwork and started that ever-expanding version of the journey. A: I really don’t have any. You may as well ask my most significant meals—and the abundance of vital moments so far makes either question impossible to adequately answer. Influences I remember include gum trees, Beethoven, Jung, Hesse, woman, time in Japan, Soetsu Yanagi, Lloyd Rees, the Jimmy Possum chair, as well as encounters with the sort of ugliness that jolts you back to focus. A: The best tool, and material, for the job is the right one and a good result will always depend on skilful use as much as on an informed heart. Preferences for appearance or method are only preferences, but tend to be used as a mediocrity’s excuse to faction and bicker. Excellence is what matters. A: Mean spiritedness and pretension. And not being able to see as well as I know I used to. A: Does my MacBook with a wireless internet connection count?? A: Ignoring the time/money correlation for love of an idea. A: Losing a finger tip to the jointer. A: Only the wood rejected by all woodworkers should be suitable for pulping..
A: Not nearly enough are women. And I still feel disappointed by the lack of courtesy of those few who don’t bother to say thanks when I’ve taken the time to answer their emailed questions.